It is likely that your teenager will get a new tech device this Christmas. That is, if they don’t already have one. I wrote about this in a previous post and talked about the ways you, as a parent, can monitor and regulate your teenagers use of devices. Here are some ideas for how to help your student make their own choices and boundaries. Understand that this is a self-control goal. We all struggle with self-control in some area of our life. As students grow up, they will expose many areas in their life that need self-control. Technology use is just one of them. When we focus on the underlying problem, it is not just a battle for more technology time. So helping them see the importance of self-control is key. As they buy in, the idea that technology is a tool (not a toy) can help shape why it is important to regulate their own screen time. Finding the right monitor or software is not the solution. I love that Amazon Kindle for kids highlights that you can set time limits and access limits for your kids. But this is really about you as the adult not being engaged and relying on the tech to do the monitoring. This is not a slam on you as a parent, it is pointing out that if we are not watching and paying attention to what our kids are doing, we will miss when something doesn’t work the way it is supposed to. We also wrongly communicate that the device is in control. This is not something I want my kids to think. I want them to have the power over their device and not be controlled by it. Starting at 8 years old, my wife and I expect our kids to set their own timer for their screen time. This puts them in charge, and if they don’t use it responsibly, then they lose the privilege of using a device. Using technology is a privilege, not a right. Just because other kids get certain devices doesn’t mean everyone does. Just because the school lets a student have extended periods of iPod or ChromeBook use doesn’t mean that happens at my house. The use of technology is for those willing to accept the responsibility that comes along with that. This means that your teenager should be happy to let you look at their text messages, social media interactions and location tracking. The balance of this is that you, as the parent, handle this the right way. Ask yourself, “Have I created a welcoming environment where my teen knows they can approach potentially uncomfortable conversations without me “freaking out”?” If not, start creating that space now and changing the way you interact with your teen so they can learn the lessons they need to before they leave the safety of your home. Finally, be okay with mistakes. Teenagers are going to make mistakes as they learn these lessons. You must be willing to work with them. Understand you are in the coaching stage. It is really too late to discipline life lessons into them, although there are sometimes consequences of actions. But instead, you are there to hear from your teen how that decision has affected what they want to do and who they want to be. Then, help them find a solution to correct things and move on. Ultimately you are helping them learn how to make decisions so they can keep making the right ones. I hope you and your family have a Merry Christmas and that your 2018 begins with some focused and intentional ways your family can work together even better this coming year. What else would you add here? 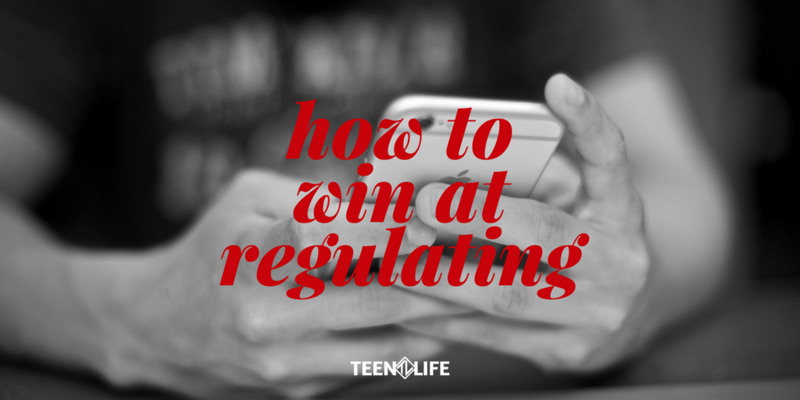 What have you seen work in trying to help your teenager self regulate and use their technology as a tool not a distraction? Ricky Lewis is our CEO and has been with us since the beginning. As a father of 7, he seeks to help parents and their kids Live Life Better.